In September, I took part in my first ever hop harvest. 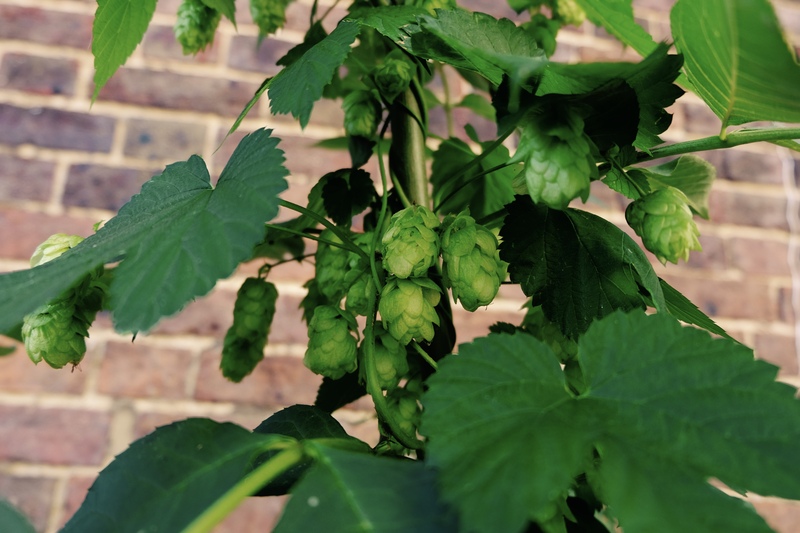 This wasn’t in a Kent hop garden but in the back yard of the Mad Squirrel bottle shop in Berkhamsted where I’d gone to find out more about the brewery. 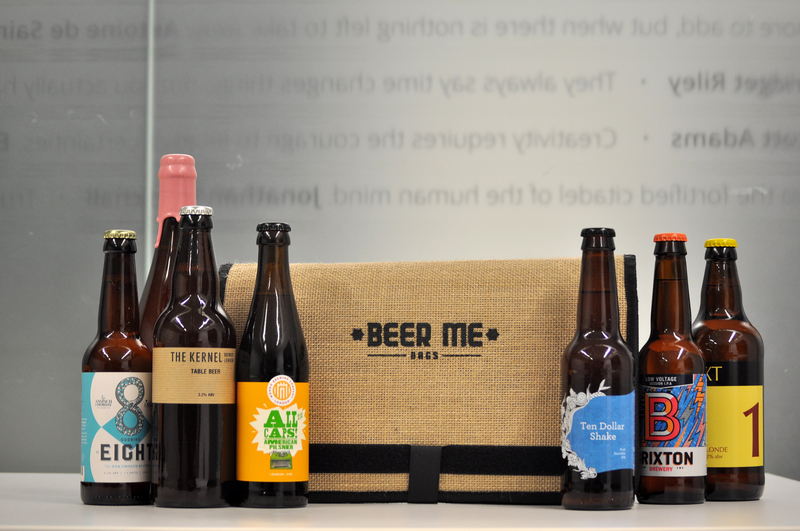 We made a start at seven in the morning which seemed too early to be doing anything related with beer, but those on the supply, serving and brewing side have a different experience. There was a chill in the air that signalled summer’s end and the sky had a violet umbra like a cheap Merlot hangover. I could still see the stars. I asked supervisor Tim whether it mattered that all the mustardy pollen was going into the bags with the hops – not realising what I was saying. These are the lupulin glands. The resins contain the bittering compounds and the oils harbour the aroma. It’s essential they go into the boil – they constitute the feature presentation! The little yellow custard sprays reminds you hop cones are actually flower heads that insects visit in their drunken dock-ins. For some reason, I’d never integrated Humulus lupulus in with the rest of the countryside flora. The harvest caused considerable sneezing. Picking each drooping cone of luminescent green from its strig, it made me think of a time when our ancestors knew their way around a hedgerow. We used to know the properties and potentials of everything by sight, feel, sniff and season. In much of the world, this still endures. In ours, it’s now the subject of tutored walks. We’ve de-natured. There’s a fug to hop harvesting that’s difficult to explain – it’s a presence in the air that your olfactory bulb absorbs – it forms the ether. Once all the sauces, sugars, salt, spice and sweeteners have been removed from our food, this is the pure green flavour that comes up. It’s the actual taste of vegetation. Chlorophyl is its blood. As the bines disintegrate, the hops spray out their oils and powder into the atmosphere and induce a calming effect which is utterly therapeutic. You drift towards the seduction of drowsiness and somnolence. At times, I had the feeling that I’d just jolted back up from falling into the gentle ditch of slumber. The conversation would ebb, there’d be a pause, our heads would get heavy and we’d realise we’d all fallen silent as though trills of anaesthetic were being pumped into the courtyard. The “sopor” in soporific comes from the Latin for deep sleep. A few years ago in my current job, I rushed to a flat on a council estate in north London to the aid of an elderly woman who had fallen. She’d used the red emergency button around her neck to raise the alarm. I found her sitting crookedly in her landing and checked her over. I didn’t get her up because I knew she’d fractured her hip so stayed with her and made her as comfortable as possible under the circumstances. We waited for the London Ambulance Service. What does this have to do with the subject? To get someone’s mind off the pain of injury, you pick their brain and let them steer the conversation themselves. She talked about her working holidays in Kent as a young girl from the east end of London. For a while, she forgot about the throb in her hip as she recounted the process of hop harvesting. Her eyes focussed on the reel of memory. She was elsewhere – not on the Lisson Green Estate anymore. She used a terminology I’ve forgotten about ringing the bines off with twine. I wish I’d taken notes. For a few moments, these recollections blanked out the pain. It was one of the many experiences in my job of which I’m grateful. I’ve glimpsed many windows into a Britain now vanished through the eyes of older Brits. Back in Berkhamsted, the bines only covered both sides of two fences. After four hours of plucking, the yield came to just over eleven kilos. We didn’t have time to gather them all as the boil had already started several miles away at the brewery in Potten End and the cargo had to be rushed off to infuse it. The yield was bundled into the back of a car in six bin liners. The aroma permeated the inside from the boot making it honk like a Holland & Barrett storeroom. 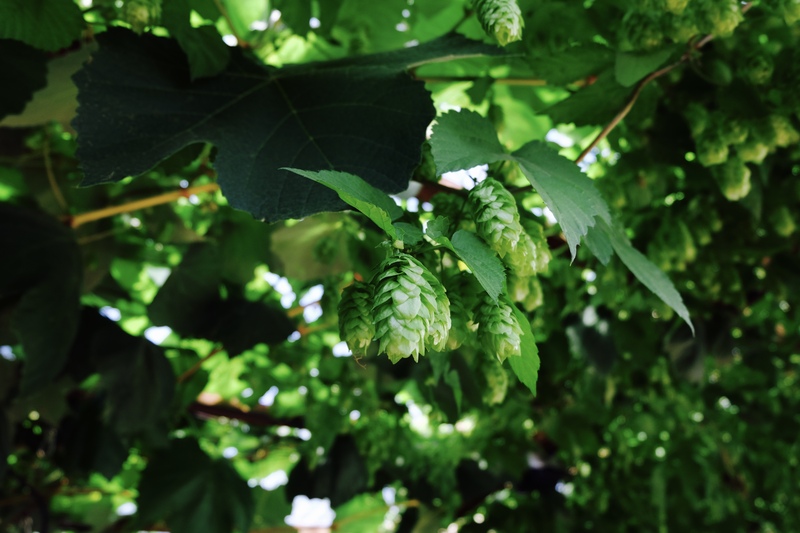 A waft of it from an open window would’ve caused any police officer’s pupils to dilate and their sniffer dogs to bark – hops belong in the same taxonomic family as cannabis. The cones were put into a giant non-bleached muslin sack which served as a massive tea bag which was then stewed for an extended period in the kettle. 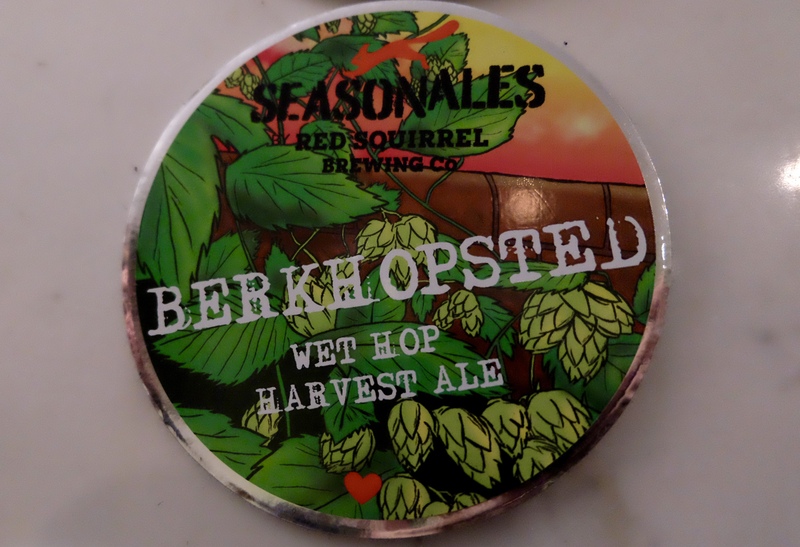 The beer went on sale at the St Albans Beer festival and as are wet-hopped beers’ wont, the taste can’t really be predicted – especially with eight hop varieties. The ale was grassy with a surprising minty uplift. If you ever get the chance, I’d recommend getting involved in a hop harvest. There might be a time when they’re seen as being more healthy and beneficial to the soul than raw food or yoga. Fascinating! We are so disconnected these days from where our food comes from and through whose hands. Its wonderful to be able to get involved, even with one harvest, and have the experience of seeing food at its source. Thanks for sharing your experience!